Hundreds of thousands of Israelis under siege by Gaza terrorists, 44 rockets counted since midnight. 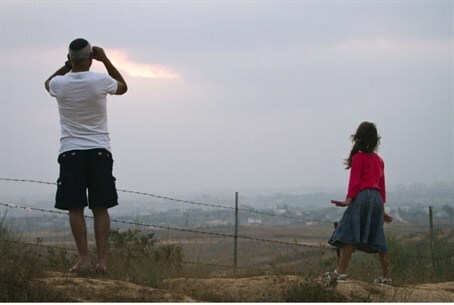 Israelis watch rocket launches from Gaza. Four people were hurt, one of them seriously, in a terror rocket strike on the Hof Ashkelon Local Authority Tuesday night. The Maariv website says the injured Israelis are Border Policemen, and that the seriously injured man is an officer. Forty-four terrorist rockets slammed into southern Israel between midnight and 10:30 p.m. Tuesday. Most rockets were of the short range Kassam type but three Grad Katyushas were fired at Netivot. No casualties were reported but the incessant rocket fire has placed hundreds of thousands of Israeli under siege since yesterday. The IAF has carried out three strikes on terror targets in Gaza in the last 24 hours, killing at least six terrorists. An IAF strike Tuesday afternoon severely injured a man who was on a motorcycle, Gaza sources said. Hamas has taken responsibility for the rocket fire at the Negev. It said it was trying to hit the IDF's Zikim base, and that the rockets were a response to IAF strikes last night. No Israeli casualties have been reported but thousands of residents have been forced to spend the day in shelters. The two terrorists who infiltrated Israel Monday were a Saudi citizen and an Egyptian belonging to a hitherto unknown group called the Shura Council of the Mujahedeen at Al Quds, Associated Press reported. The two appear in a video made public by the group in which they can be seen reading their final wills before launching the attack. In a leaflet published along with the video, the group dedicates the attack to the Al Aqsa Mosque, Arab terror prisoners held in Israel, and Osama bin Laden. The terrorists killed one person before being killed themselves. The prospect of missile attacks on major Israeli cities seemed outlandish before the 2005 Disengagement from Gaza, but Israel has since grown used to such attacks. The government did not declare anything resembling a state of emergency Tuesday and the prime minister found time to doodle.